A certain branded bike-share concern has been talking about expanding its home range for a while now. Finally, that talk has coalesced into a plan. 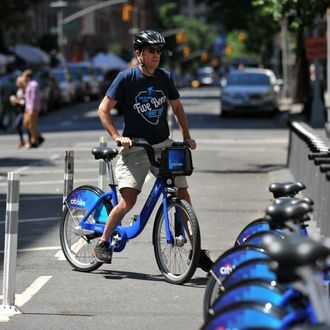 According to The Wall Street Journal, Citi Bike will put in new stations up to 86th Street on both the east and west sides. The stations currently extend as far as 61st Street. Motivate, the company that controls Citi Bike, said they aim to start putting them in before the end of this year. Additional stations will come to West 110th Street and East 96th as early as 2016, so it’s just a matter of time before Central Park is absolutely flooded with slow-moving cyclists. Citi Bike wants to double its fleet by 2017, and the bike-share program will eventually add stations in Queens and expand out into Brooklyn, though those neighborhoods still have some time to prepare for the influx of blue bikes.